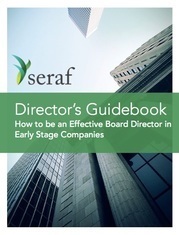 Also includes an Appendix with helpful templates and guides for Board Directors. This 168-page book will teach you about the roles and responsibilities of Board Directors in early stage companies. Interested in purchasing a hard copy version of the Director's Guidebook? Buy it now at Amazon.com.